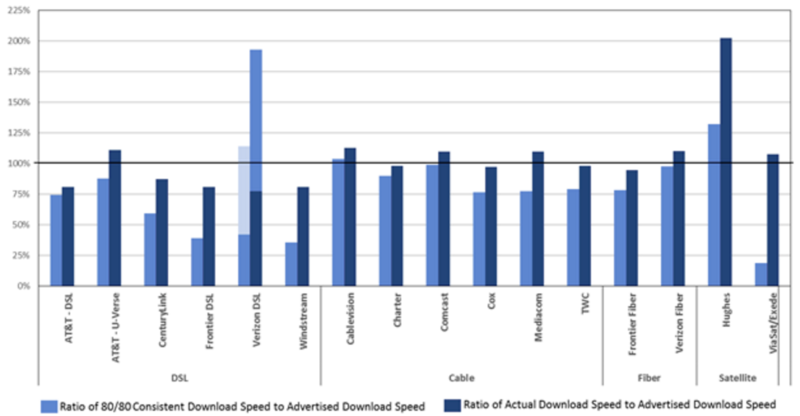 " Largely spurred by the deployment of enabling technologies such as DOCSIS 3, the maximum advertised download speeds offered by ISPs using cable systems increased from 12-20 Mbps in March 2011 to 50-105 Mbps in September 2014. 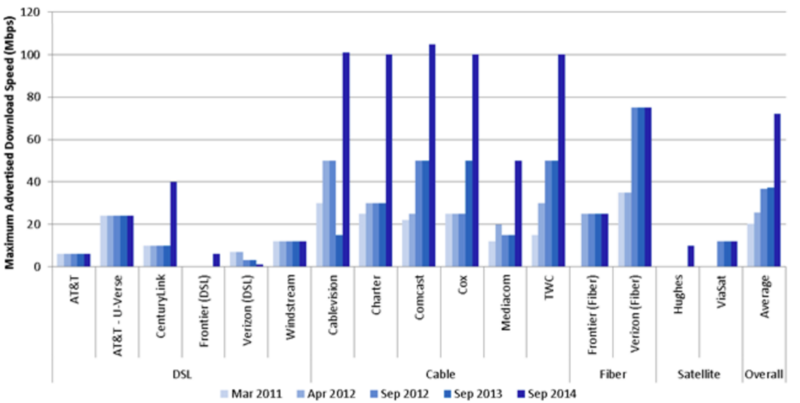 However, popular maximum DSL speed offerings have not kept up with that growth. While average DSL consumer speeds have increased, popular maximum DSL speed offerings have stayed largely stagnant since 2011, with most DSL providers offering maximum download rates of 12 Mbps or less." And that 12 Mbps mark is rather generous. There are tens of millions of DSL customers who are lucky to nab 3 Mbps downstream on a good day, thanks to phone companies that face no serious competitive incentive to upgrade. Worse, some of these companies (like AT&T and Verizon) are actively trying to drive these unwanted customers away with apathy and price hikes so they can focus on more-profitable wireless. Others, (like Frontier, Windstream and CenturyLink) are buying these aging assets up, but wind up being so saddled with debt meaningful upgrades aren't possible (assuming they had competitive incentive to do so). For a few years now the FCC has taken to naming and shaming ISPs that fail to deliver advertised speeds as part of the report. And for a while, it paid dividends. Cable companies singled out in the report one year for poor performance (like Cablevision) would return the next having notably upgraded provisioned speeds for fear of bad PR. Even notoriously awful satellite providers, motivated by 4G wireless, have been improving things with new Ka-band deployments. But proudly, consistently, the nation's DSL providers continue to under-deliver in terms of both overall speed... ...and also how close they get to their advertised speeds: And this won't be changing any time soon. With no competition to speak of, most of these telcos intend to cherry pick only the most profitable areas over the next decade (housing developments, university dorms), then pretend these deployments are much broader than they actually are (aka "fiber to the press release"). Simultaneously, most of these underperforming telcos (CenturyLink & AT&T especially) have been busy lobbying, buying and quite-literally writing state laws preventing towns and cities from upgrading their own broadband, or from getting outside help in the form of public/private partnerships. The result (despite a lot of hype surrounding gigabit deployments) is a huge swath of the country that will likely be stuck on last-generation DSL for the better part of the next decade. And while a lack of real broadband competition is the obvious culprit, these same companies will be sure to blame everything from net neutrality to rogue yeti for their miserable failure to provide even the barest semblance of mediocre service. I'll name Verizon. Who didn't care about my 750kbps speed despite advertising 3mbps. And yes, it's sad when Comcast is a better option.